← Welcome Manila nostalgia fans ! Juan Luna is one of the most celebrated Filipino artists. His works may be found in museums around the world. 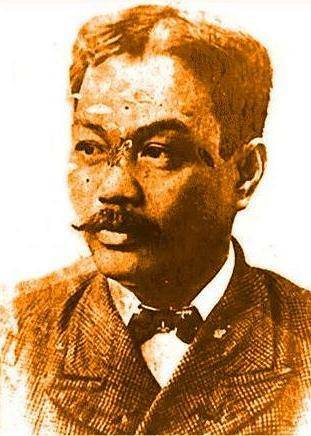 What is not common knowledge is that he was the father of another important figure in Philippine architecture, Andres Luna de San Pedro, son of Juan Luna and Paz Pardo de Tavera. Born in Paris, he set foot in the Philippines with his father and uncle, the great Antonio Luna. He was taught painting in Manila’s School of Arts. 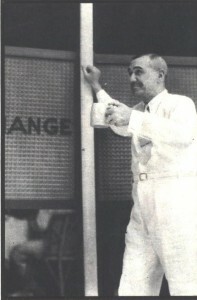 Andres Luna de San Pedro-architect. He studied Arts in Paris where he got his diploma in 1911 and went on to study Architecture and finished in 1918. 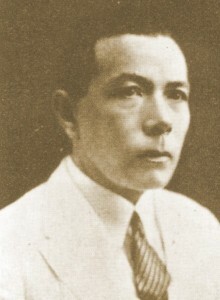 Upon his return to Manila, the city government appointed him the chief Architect, a position he held from 1920 to 1924. He first got attention as a painter in Hanoi where he won special mention. He won a silver medal in the St. Louis Exposition and another in a contest held by the Exposition of the Society of Artist in Manila (1908). Andres was a talented architect who seemed destined to equal his father’s artistic achievements. 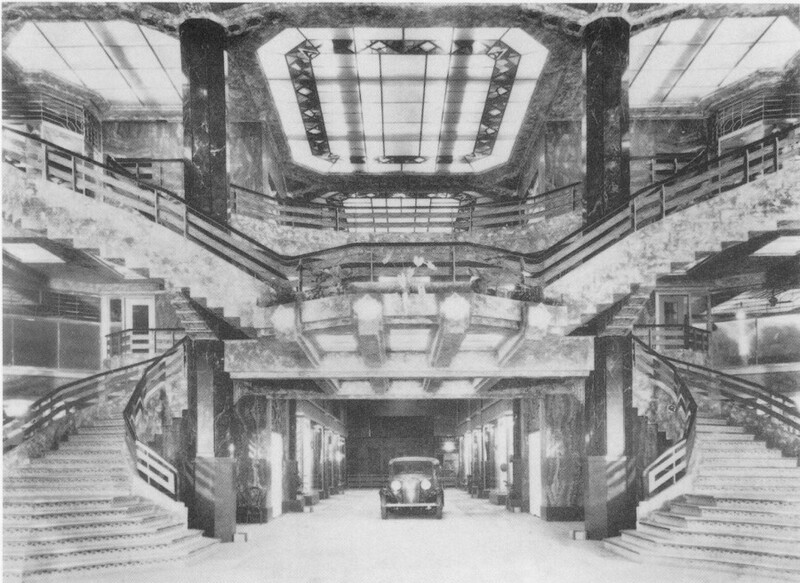 In the 1920s, he became obsessed with the design and construction of a glass palace to be called the Crystal Arcade, inaugurated on June 1, 1932. 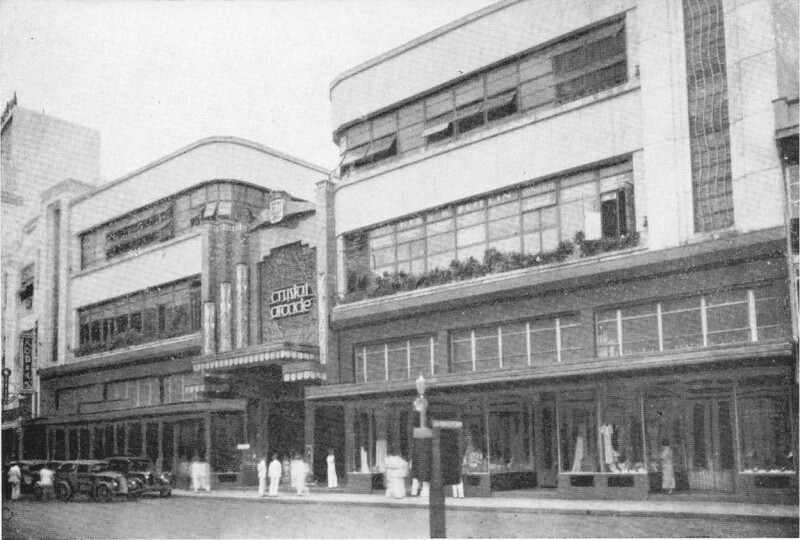 The Crystal Arcade was literally a crystal building in graceful art deco lines, very fancy for Manila of the 1930s. It housed the Manila Stock Exchange as well as offices and upscale shops where Manila’s elite would go as much for the prestige of being seen as for the air-conditioning, which was uncommon then. Crowds visit the Crystal Arcade. As the name might suggest, the Crystal Arcade appeared as both a magnificent monument to and spectacular site for consumption. Andres envisioned it as a grand commercial center. 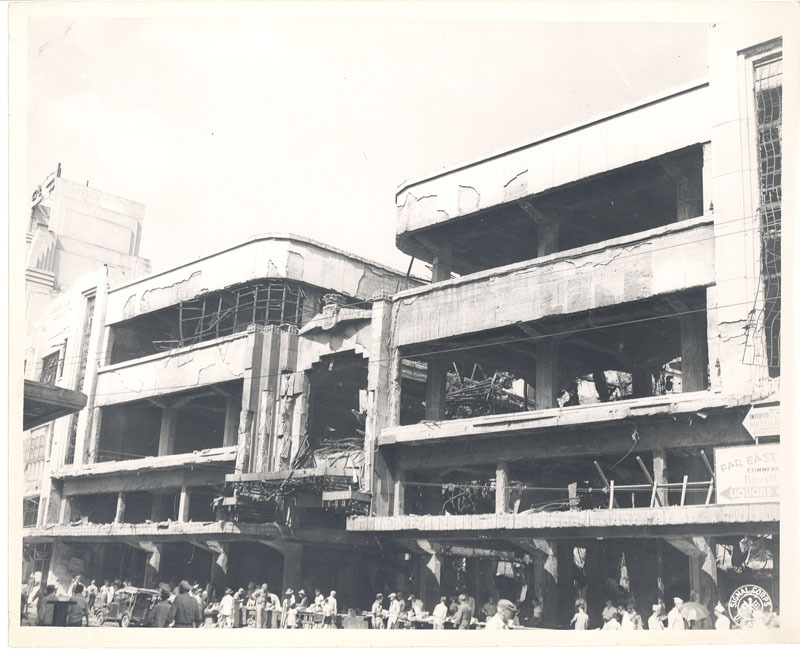 It emerged as Manila’s first shopping mall that featured a walkway lead-in to the glass-walled shops on the first floor. Inside the Crystal Arcade watching the stock board. 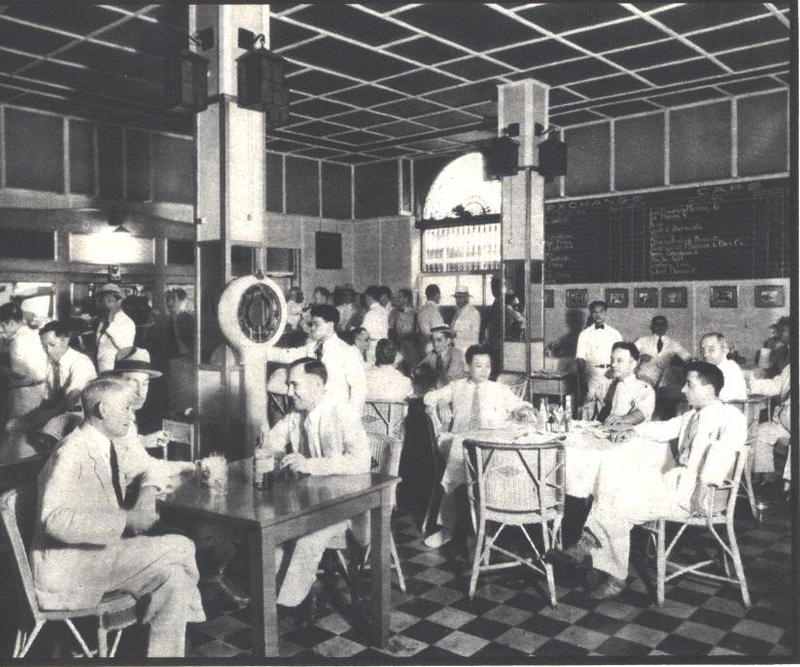 Inside the Crystal Arcade was one of the more popular hangouts for stock brokers and their clients called, the Exchange Cafe, owned by Walter A. “Monte” La Mountain, a previous member of the 26th Infantry Regiment that stayed after the Spanish-American war. The Arcade had a mezzanine on both sides of a central gallery that ran through the length of the building and expanded at the center to form a spacious lobby containing curved stairways. Stairs, balconies, columns and skylight combined to create vertical and horizontal movement, as well as a play of light and shadow in the interior. Art deco bays pierced by a vertical window marked each end of the façade and complemented the tower over the central lobby. Wrought-iron grilles and stucco ornaments were in the art deco style featuring geometric forms, stylized foliage, and diagonal lines and motifs. The Crystal Arcade – 71 Escolta street. 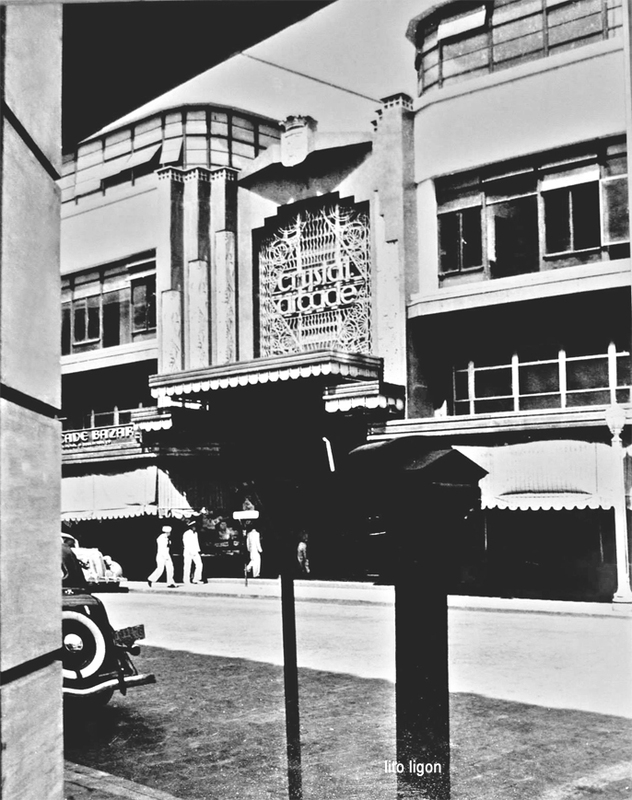 At a time when art decorative no longer symbolized high culture and iron and glass had been strongly identified with mass culture constructions elsewhere, Manila’s Crystal Arcade with its art deco lines was considered the most modern structure in the country. One of the things lacking in the Manila of the Thirties was a supply of fresh Stateside candies. As luck would have it, the wife of Ted Lewin, well-known gambler and entrepreneur, came from the States to join her husband in Manila and brought with her recipes, a copper candy kettle and thermometers with the idea of making and selling candy. Rae Lewin rented a store in the Crystal Arcade next to the Manila Stock Exchange, hired the help and even made the brown skirt and white blouse uniforms. The candy was delicious, the aroma of vanilla wafted out to the noses of the stockbrokers and their customers and quite soon was a hit ! On the first floor, stores lined the hallways. The Crystal Arcade was magnificent, a study in light and space, with a central staircase that seemed to float upward into a vast foyer. Indeed it decorated the Escolta and drew many admiring visitors. But the very qualities that made it an attraction weakened its value as a commercial property. There was insufficient room for offices and retail activities. Andres Luna was certain the building would enhance the Escolta’s commercial primacy and increase the value of the family’s holdings however, building on the quay side of the Escolta, contractors encountered a high water table. The building’s foundation became a complicated and costly construction, a veritable sinkhole into which the corporation’s resources drained. As the grandiose scale of both building and budget became obvious, people began to refer to it as the Pardo de Tavera mausoleum. 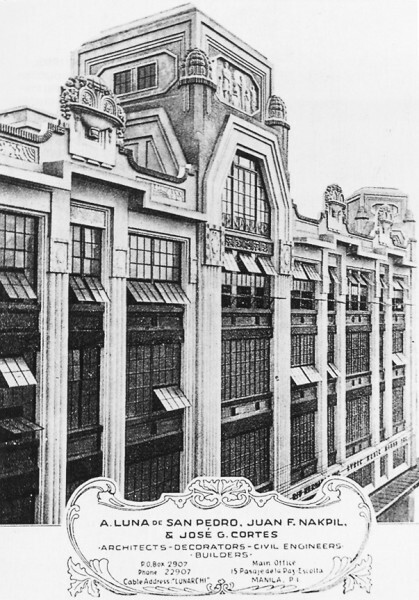 Saddled with an enormous debt, the Pardo de Tavera corporation soon found that the building did not generate enough income. 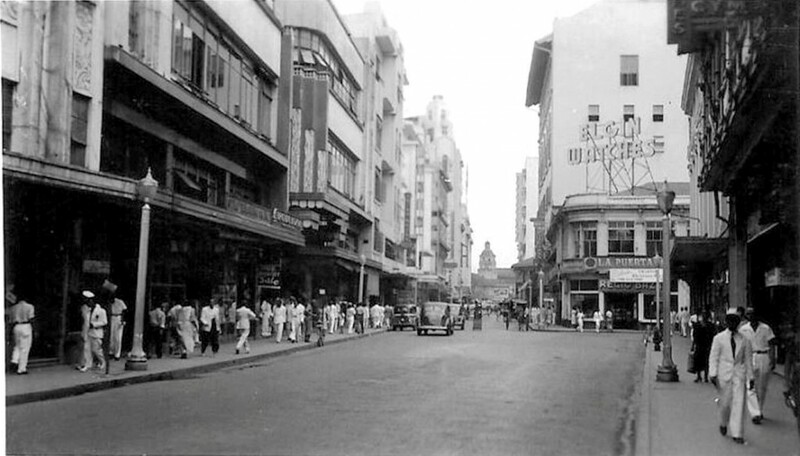 During the famous Crystal Arcade case of 1931, the Supreme Court of the Philippines ruled that the Pardo de Tavera holdings on Manila’s premier commercial street, the Escolta, forfeit to its creditor, El Hogar Filipino. The property had been used as collateral in a large development project undertaken by the family firm, Taverna-Luna, Inc. Despite frantic efforts, the Pardo de Taveras corporation was unable to forestall financial ruin and the lending company, El Hogar Filipino assumed ownership. 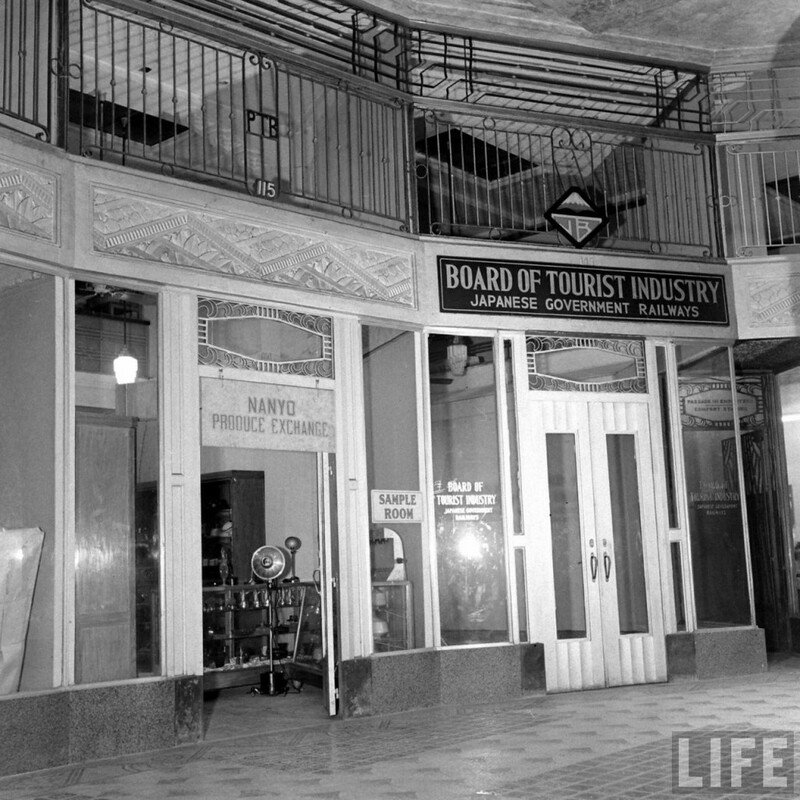 In rather an eerie photo taken in early 1941, the two photos below shows what the offices looked like within the Arcade. 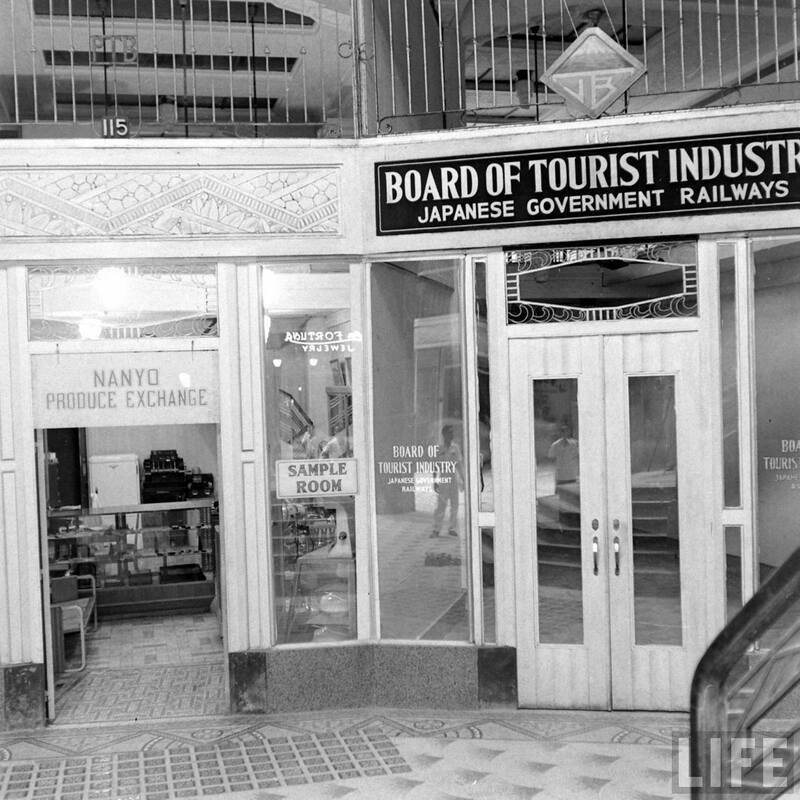 I wonder if this “Board of Tourist Industry” might have been a front for a Japanese spy organization. 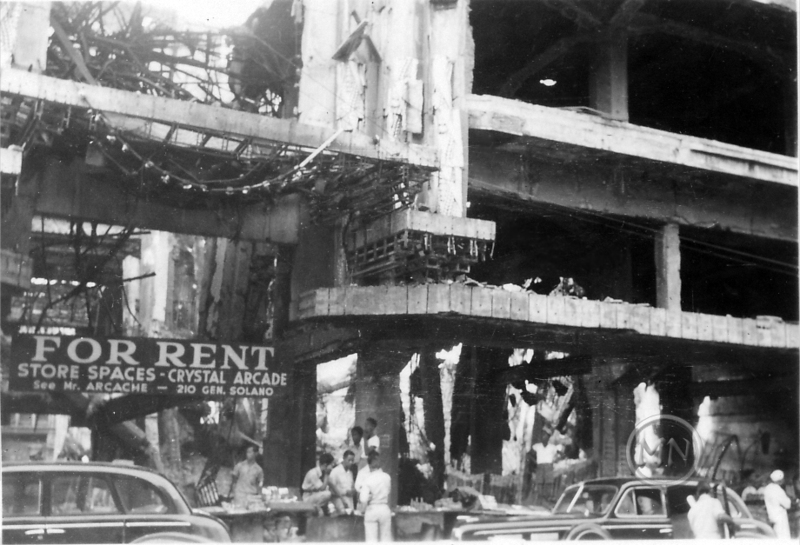 Alas, the Crystal Arcade did not survive the brutality and destruction of the Battle of Manila. It was almost completely destroyed with only a shell of its former glory standing. 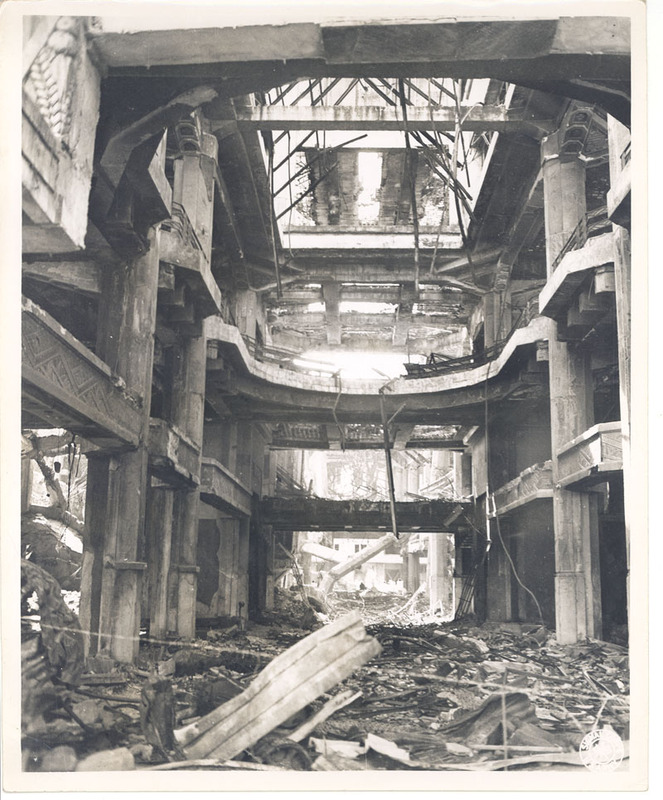 The destruction of the Crystal Arcade-1945. 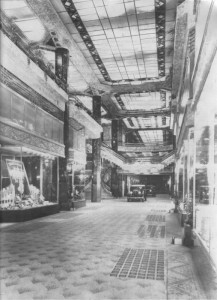 Crystal Arcade interior in ruins – 1945. 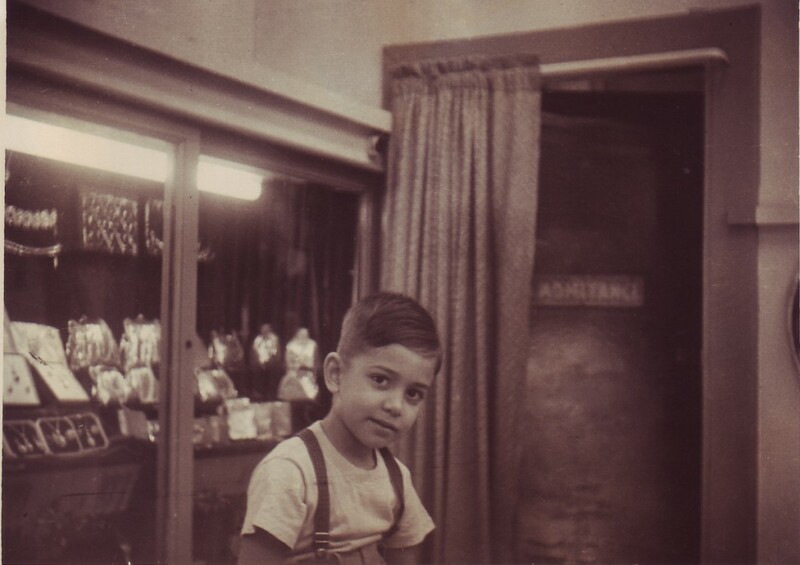 Me, around 4yrs old sitting on the counter in our store. In the photo above, reconstruction starts. Spaces in the Crystal Arcade are already for rent even though the building remains a tangled mess. My father rented his space from Arcache at 67 Escolta which was the furthest space on the right of the old Arcade, closer to the Lyric Theater. Our store, the Gem Gift Shop, was located next to the Escolta Restaurant (M.Y. San). As I recall, only the first two floors of the Arcade building were kept. Our small store was on the first floor with a stockroom at the second level that housed our watchmaker and jewelry repair. It was only later in the Sixties that our store, along with others, were torn down and rebuilt properly. The old Philippine National Bank was constructed at the former arcade building location. The photo below shows restoration in progress around 1946. Retail stores have popped up on ground level of the Arcade although the damage above is still evident. These photos taken in 1955 show little had been done to complete reconstruction. 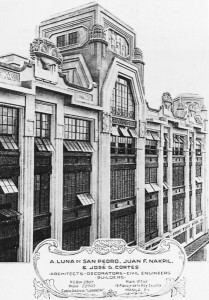 The third and fourth floors had been removed and the second tier above the retail stores remained a hodgepodge of clap-together construction. Our store, Gem Gift Shop, is where the green striped awnings are. Rebullida is under repair. To the far right, the Escolta (M.Y.San) Restaurant building has been reconstructed but sadly, the Arcade building remained a shell with weeds growing above. 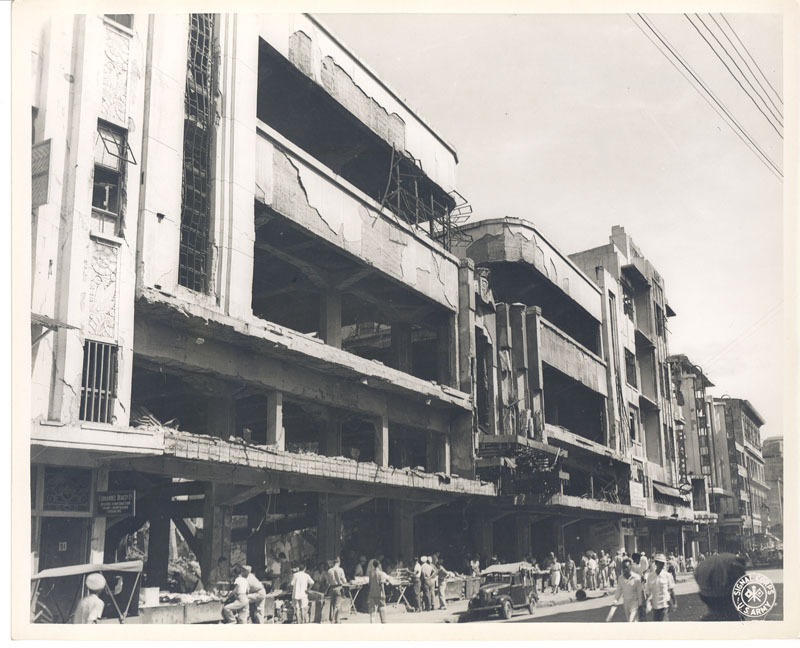 Finally, the Crystal Arcade is torn down and construction started on the Philippine National Bank head office in 1966. Our store was located right behind the Volkswagen. The Escolta Restaurant still remains albeit on shaky ground. Architect Andres Luna de San Pedro also designed the Legarda Elementary School on Lealtad Street, in the French renaissance style. Within the 1920s he moved on to modernism and produced the Perez-Samanillo Building and, subsequently, the Crystal Arcade. The Perez-Samanillo is a straightforward, no-nonsense office building, with a somewhat elaborate exterior that reflects its structural frame. Columns, beams, and exterior walls appear to have been kept down to minimum dimensions to maximize the expanse of windows and the natural illumination within. As a side note, Andres Luna’s childhood was filled with tragedy. In a fit of jealousy, his father Juan Luna murdered his wife, Paz Pardo de Tavera and his mother-in-law Juliana Gorricho in front of young Andres. 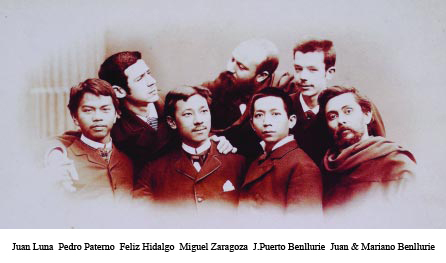 I’ve also included a photo of Juan Luna here with my relative, Miguel Zaragoza, and other pals in Paris. 38 Responses to The Crystal Arcade – Art Deco at its finest ! What an interesting bit of history on that famous building. I enjoyed reading your description of the Crystal Palace and the history behind it. 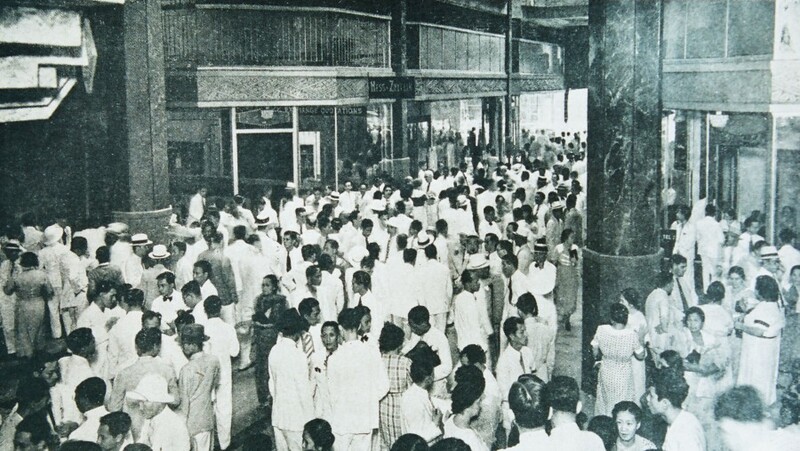 I remember taking a field trip to the Manila Stock Market in the mid-1960s. I think it might have still been in that area. I’m glad you included the connection between your family member and Juan Luna. Many of the streets we lived on in San Lorenzo were named after those famous Filipinos. I wish the American School had given us a course in Filipino history starting in elementary school. For now I will enjoy catching up on some of its history through your blogs. Thank you Connie. It’s also fun for me to do the research and come up with this bit of trivia. I’m finding out stuff about Manila I never knew ! I really appreciate this post about Crystal Arcade, I would never have known it once existed. My mother wasn’t even born at that time. I’ve always thought Shoe Mart Quiapo, Farmers Market, Plaza Fair (and the likes of them established in the 70’s and early 80’s) were the first malls. Loved the photos too! I wonder what’s standing at 71 Escolta today. Sir! Would you know where the #12 Interior, Escolta is located? 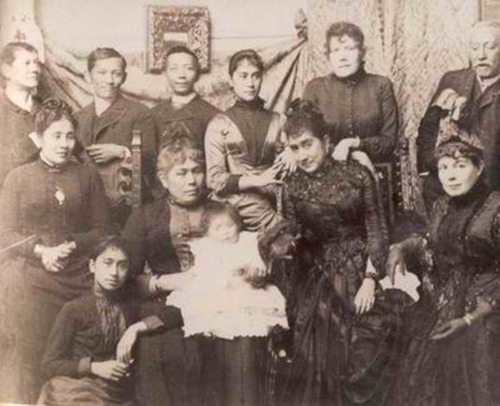 Looks like the lady on left of Maria Pardo de Tavera is Nelly Boustead, girlfriend of Jose Rizal. Lou loved the blog and the stories attached to the building. Our society publishes a quarterly journal called the Spirit of Progress. We include stories about Deco from around the world. Would love to reproduce your article in a forthcoming edition. If you are agreeable, can send you a copy of the latest journal so you can check the quality. According to Alfonso Aluit in his book By Sword and Fire a large explosion damaged the Crystal Arcade on 4 February 1945. The explosives were planted by the Japanese military, and the area was later targeted by American artillery. Yes, I’ve read the book also. Unfortunately, the beauty of Manila was stripped away by the ravages of war, not to forget the 100,000 people that were killed during the Battle of Manila. I obtained much information from my dear friends Dr.Rico Jose and Peter Parsons, both of whom have studied and produced books and film on the subject. Hi Jules – as a matter of fact, I remember Rebullida’s well since my dad also had a jewelry store “Gem Gift Shop” which was just a few stores down from Rebullida towards the Lyric Theater. My relative, Jose Antonio Araneta y Zaragoza (1905-1985) married Margarita Rebullida having 7 children. My mother was a Zaragoza from her maternal side. So, your wife and I are most likely related. Small world, huh ? 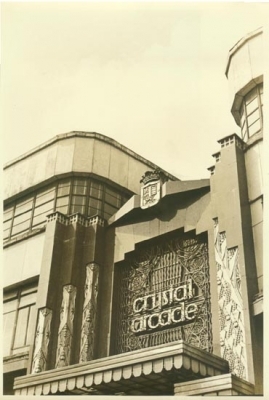 I have always been fascinated by the Manila that had existed up until December 8, 1941, and the Crystal Arcade is one of the gems of that era. Thank you for the very informative write-up–documentation on this structure is pretty hard to come by. It is interesting to read about Escolta. You had mentioned in another article about Escolta Restaurant (M.Y. San) and that you stayed there until your father picked you up. Perhaps my father and the waiters knew you as he was managing the restaurant. Hi Peter, yes- perhaps your father and I met. I was the chubby kid who would go in by himself and have my merienda which usually consisted of a plate of shanghai fried rice then maybe go see a movie.This was around 1956 thru 1962. I recall it had 2 floors ? Perhaps 3. Usually quite a noisy din as it was always busy with chatter of customers and clatter of dishes. It always brings back fond memories. Thanks for visiting my site. Please send your mom my regards and tell her that I always enjoyed the food and service at your fine establishment ! 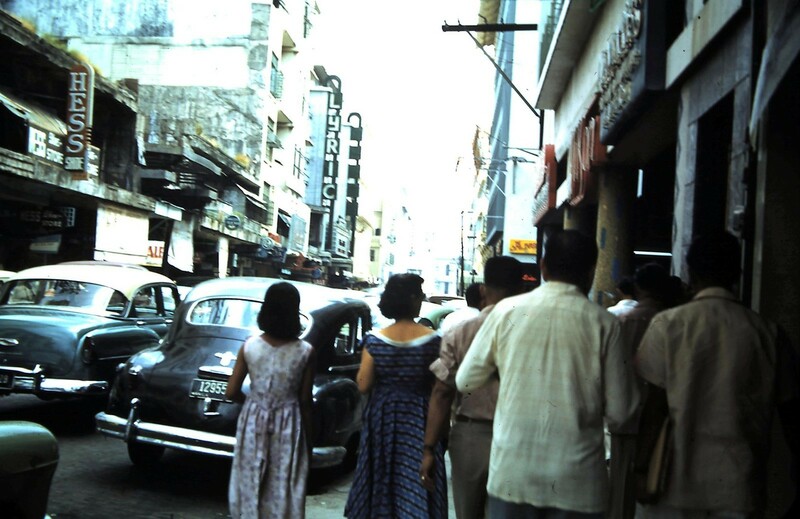 By the way, does your family have any photos of your restaurant – both exterior and interior or perhaps photos of the Escolta ? I would love to see them and post them here. Thanks ! Hi. Would love to send you old photos as I have them filed somewhere. However, I don’t think I have interior photos. Kindly email me an address that I can send you the photos. By the way, the name of Escolta Restaurant lives on when The Peninsula Hotel in Makati renamed it’s main restaurant Nielsen’s to The Escolta after they did a major renovation a few years ago. They also have photos of old Escolta on the walls of the restaurant. Perhaps one day you could visit again. Mr. Gopal, I must say, you just showed us the best pictures of the Crystal Arcade. Dad and Mom only told me stories of this grand pre-war mall, but never saw it. It has always fascinated me like the Estrella del Norte, Heacock’s, Bergs, Botica Boie and Clarke’s Ice Cream Parlor. Many more since the places I knew as a kid were just the Soriente-Santos, M.R. Villar Record Bar, Syvel’s, and of course Lyric and Capitol Theaters till their last hurrah. just a little tad younger and awed by the edificies of yoour generation. Syvels was located at the building of my great grand father Gonzalo Puyat. Even now, the signage is still there. crossing the streets and going about their lives with such elegance. My mother used to talk about the crystal arcade…how she would point to Spanish fans and her father would buy them for her. Now I can picture her in one of those stores…a spoiled teenager with a doting tatay. I was born before the Liberation of Manila. I am glad to hae found this blog. Much of what you have might be familiar, yet I am getting more insights. specializes in fountain pen repair. Great website. Pre-war Manila literally and figuratively almost totally wiped out. I grew up on Dakota St. diagonally across the Rosaria Apartment and later on a side street, Alonzo St. in the in the 1950’s-70’s. Lived abroad for years, now back. Still think about Malate-Ermita with great fondness. If only they would clean it up a bit, they are still great places to live. 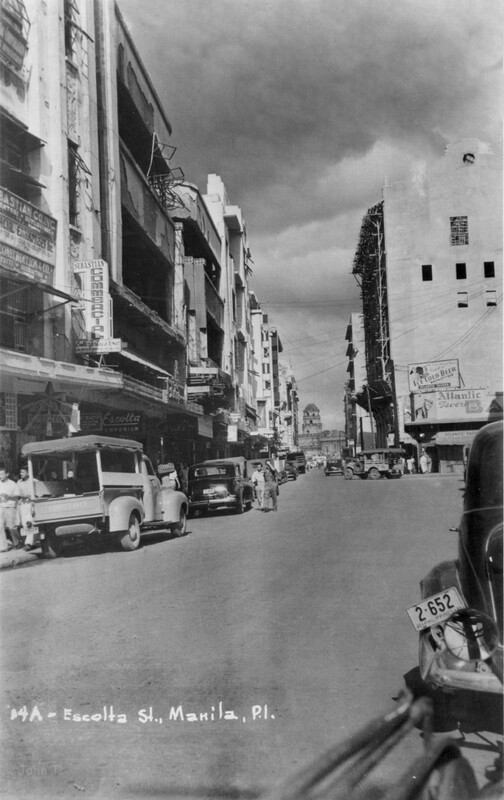 Hope people would send pre-war Manila pictures they might have kept somewhere for you to post. And for younger folks to rediscover and enjoy. I’ve been doing a TON of research on my family since my Dad passed away last summer. I just found your site and am wondering if you happen to have any information or pictures on Botica de Sta. Cruz or the owners, Valerio and Carlos Jahrling (they are related on my Dad’s side, my grandmother was Josefina Jahrling Rodriguez. I believe the Botica had a location in Plaza Goiti in Manila during WWII. I have enjoyed your site and appreciate all the work you’ve put into it. Thanks for any help! makasaysayan pala talaga nag escolta ,,sayang ..
mas maganda pa mga arkitektura nuon kesa ngaun. I really enjoy reading a lot of this historical information being I was born and raised in California and my mom would tell me stories of the Philippines when she was growing up. I know that I’m related to you on the Zaragoza’s side (grand-daughter of Jose Zaragoza (Ging-Ging)). The most interesting information I’ve heard is that I’m also related to the Luna family on my mom’s side…although I have not done the research. Stumbled on this blog of yours, and I’d say this particular piece of research you’ve done was something almost all Philippine history textbook authors failed to mention. I came across this gem of a building called Crystal Arcade only when a member of an FB group Old Manila, shared it with us. Immediately I got curious and was really fascinated by the pictures, and the grandiose scale that this building once showed. I just shared the 1930s Manila to my students through videos I’d gathered from You Tube (I for one, am a history teacher there) because we are tackling about the American occupation of the Philippines, and all of them told me that the feel and the nostalgia of the moment was as if the city was situated in another continent. It simply wasn’t the Manila they grew up with now…crowded, noisy, dirty and full of eyesores. My own grandparents who lived at the time, never shared to us about the Crystal Arcade when they were alive. I believe they are just looking elsewhere, simply because they are Chinese, and Chinese back then are poor, not like who we are today. Maybe that’s why they have never set foot on a such a place as the Crystal Arcade. 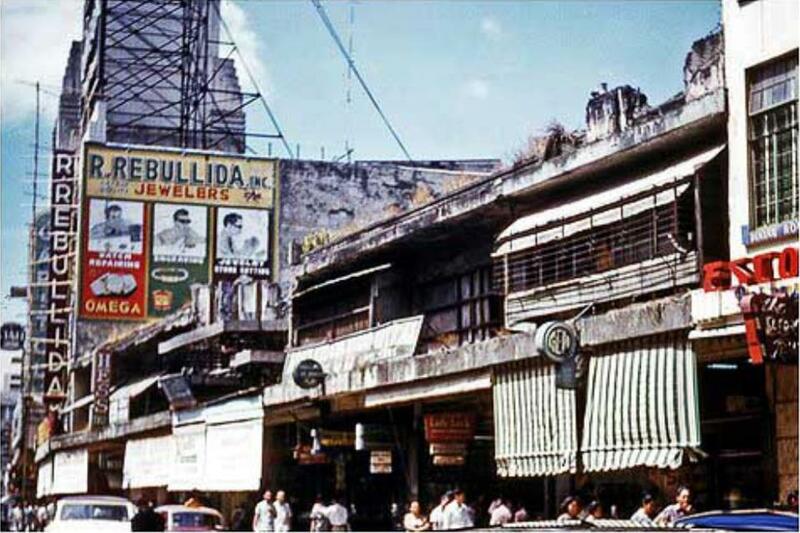 The old Escolta I knew of back then, was solely through my research of history books. And the fact that Escolta today is now a shell of its former self makes me want to cry sometimes and realize that somewhere back in time, this shopping street was once a haven for the glamorous and the well-to-do. Lou, thank you very much for sharing your father’s past with us. Makes me want to go back in time if ever there will be a time machine to transport us there…best regards!!! Hi Ed, thanks for writing and thank you for your very kind comments. Although the Escolta back in the day may have been part of the elite landscape and shopping center of the past, the Chinese workmen, artists, and businessmen even before the Americans came at the turn of the 20th century, were the backbone of Manila’s economy. They carried the trade from the ships docked at the Pasig ports, had grocery stores and other retail, created beautiful furniture and decor for the Spanish and even ran Manila’s first hotel for tourists, the Oriente. That was Ah Gong who sold liquor, foodstuffs, and managed the Hotel Oriente. Recently, the old PNB Bldg. on Escolta burned down. I was born in the mid-80’s and have not had the privilege to see the beauty of Manila back in its glorious days. Thank you Sir Lou for giving my generation a glimpse of the old times! Thank you for writing back. I will show my mom about this. Hello Sir! As a newbie fan of the history of the Philippines, I was browsing through old photos of the Philippines when I stumbled upon this article. I never knew such mall as grandiose as this existed in our country before the war. I’m actually from Gensan and my parents and grandparents were from Pangasinan and Davao del Norte and came from really poor families so they have never set foot in this place during this era. Quite fascinated and curious with what the Philippines especially Manila looked like in the past. Thank you for sharing this sir! Thank you so much about writing this piece. I enjoyed it very much. I would very much love to interview you personally. How may I get in touch with you? I am starting a coffee table book on Philippines prohibition scene and its role on the present times. Please let me know how I can proceed. Thank you so much! 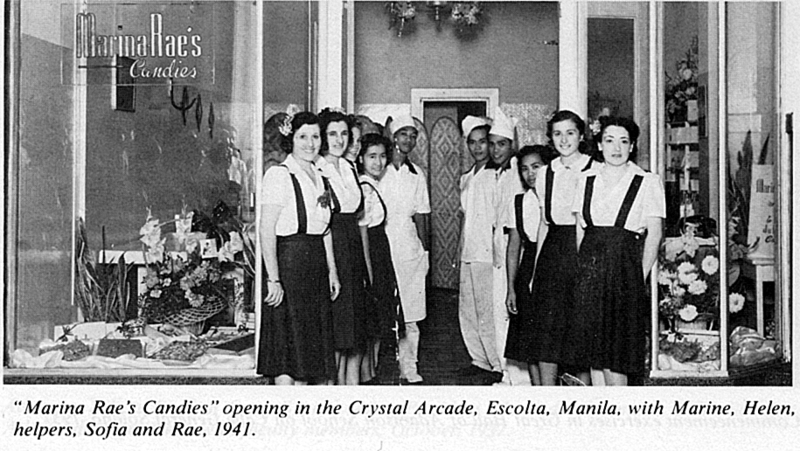 Zoilo Galang’s Encyclopedia of the Philippines has a nice photo of the Crystal Arcade. 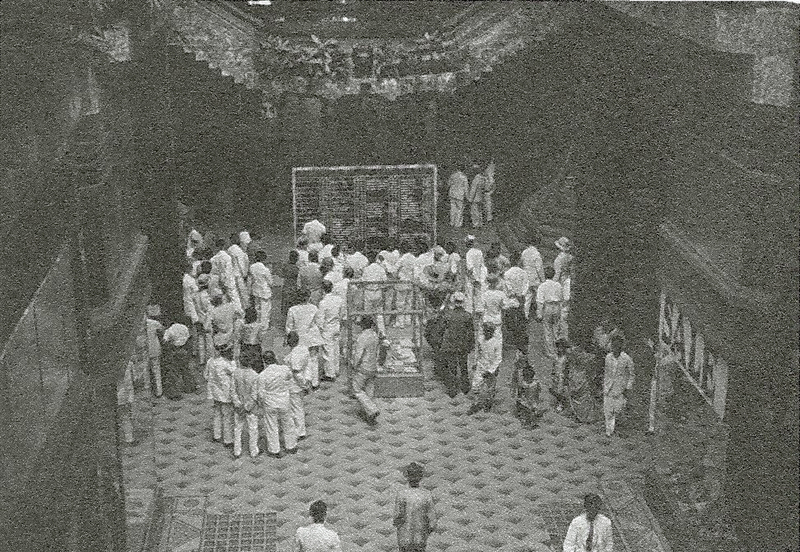 Also, the French newsreel “3 mois de guerre dans le Pacifique” (www.ina.fr) has footage of the Crystal Arcade interior at 00:25. This footage was originally used in the German newsreel Die Deutsche Wochenschau Nr 600. Thank you Zoilo. That’s the first film I’ve seen of the Crystal Arcade. Very rare indeed ! Did Andres Luna have any child? A direct bloodline of the Luna’s?? ?